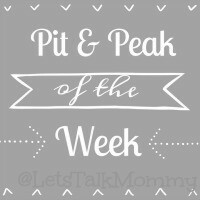 Welcome to Pit & Peak of the Week Blog Hop! Pit & Peak of the Week is a therapeutic way to vent about that week’s pit and rave about that week’s peak. Life isn’t all bubble gum and lemon drops, so let’s share what’s real, what’s really happening, and as always end on a positive note each week. Some week’s you might not have a Pit, and some week’s you might not have a Peak, that’s ok, share as little and as much as you want. P&P will open up every Sunday morning until the following Saturday evening, so you have all week to reflect back on the previous week. I would love if you would place the badge below in your post so we all know where you are partying and I will give your post a shout out on Twitter with the hashtag #Pit&Peak. Wow is it Sunday already? I can’t keep the days straight these days. But while we are at it, how nice has the weather been this weekend? We took full advantage of it as we are so sick of staying in. There has been park hopping, haircuts, and even a mini shopping trip to Cheshire Oaks with my mother-in-law to name of few. Other than that it’s been a quiet week. Pit: Have you ever tried one of those fish pedicures? Well, I hadn’t until we went on vacation to Lanzarote, where I spots these unique spas on ever corner. So finally I got the courage to do one and talked Mr. P. into it too. If I was going to get my feed ate by fish so was he. It was fun, silly and tickled a little. I enjoyed watching Mr. P. squirm while attempting to look calm and collected when really inside my skin was crawling. I was glad we did it and my feet felt so smooth afterwards. We continued on our vacation and didn’t think anything of it. Until, I got home and my toes had a rash all over them. I went to the GP and he said these fish spas are all being shut down because of the chances of spreading bacteria and other infections. Of course, I was one of those lucky people to have a serious reaction to it. I am still battling it now, and I vouch to tell everyone I know, please do not do fish pedicures! It’s a real pit! Want to write your own Pit & Peak of the Week, add the badge below and link up. You can learn more about P&P HERE. Thank you to those that linked up last week! I enjoyed reading your posts. I was so excited when I initially read your post about Buba and Oso doing the potty thing together lol! So sad that he now wants nothing to do with it! All I can say is to just remain calm about it and don’t make it a big deal. The bigger deal you make it, the more resistance he is likely to show. And trust me I totally understand the desire to have your toddler out of diapers when you have a baby that has to be in diapers! From my experience, there will come a day when he just decides that he no longer wants to pee and poo and a diaper and will want to do it like a big boy. Patience young grasshopper lol! I have no patience. It’s not a virtual of mine clearly. I think Missy Moo will be fully potty trained before Buba ever catches on but we are working on it. Slowly but surely.